In 2017, Vincent* and Priscilla*, OM workers in Kosovo, began a new ministry focussed on recording worship music in the Albanian language for the Albanian-speaking world. For several years, they had perceived the need for songs born from Albanian worshippers themselves. These songs would speak to other Albanians in their heart language, rather than just being translated from English. The couple had noticed how Kosovar believers related differently to the few locally written songs which then existed. Since then, several songs have been translated, recorded and shared online through various forms of social media. However, there has been a continuing need for more original Albanian worship songs. But bringing these to birth has been difficult, as the total number of Kosovar believers is less than two thousand, and there is very limited access to song-writing training and recording facilities. 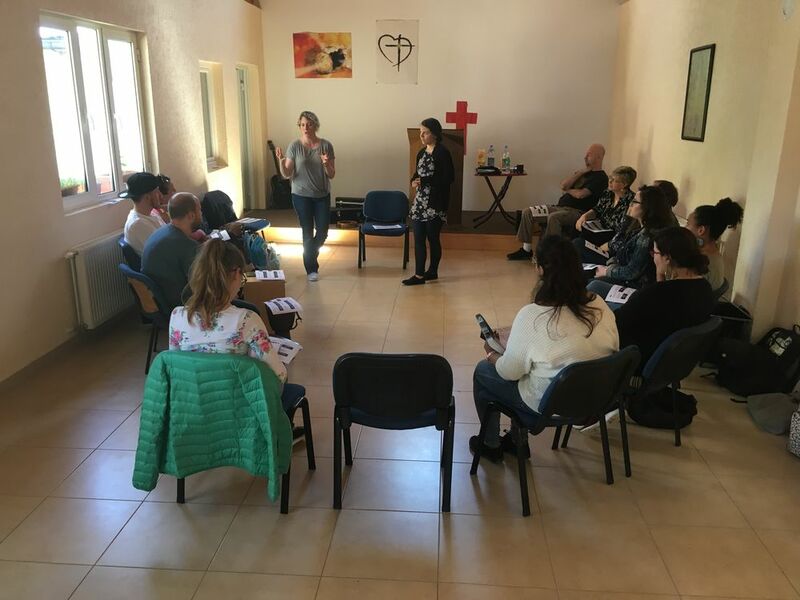 So in April 2018, OM teams in Kosovo and Albania worked together to host five people from Heart Sounds International for three days in each of their countries, giving a total of six days of training on worship music and song-writing. Heart Sounds International is a branch of OM Arts whose purpose is to inspire and encourage song-writing in the heart language of the nations. The training in Kosovo had 11 participants in total who came from different cities and churches around the country. During the training, the topics taught and discussed included brokenness, hope in the Lord, deep roots and deep trust. Participants formed groups, and in limited time, attempted to write songs and make music inspired from the accompanying topics and Bible passages. Though they came from different backgrounds, ministries and places, the participants united in their purpose—to create songs encouraging worship in the Albanian language. From the three days of training, the participants were able to write nine new original Albanian worship songs. Some of the participants stated that the experience was very unfamiliar and stretching. To sit down and write worship songs together in community sounded like a hard thing to do. Many of the participants did not believe at the start that they would even be able to write or compose anything during the three days. Yet God in His mercy poured much creativity and inspiration from His Word over the participants, so that many wrote beautiful songs together. Words like these convey the core purpose of this training: to call people from all nations and tongues to bring their worship to the Lord from the bottom of their hearts. Such are the songs written during the training in Kosovo; they are songs to bring hope and healing in times of brokenness, to call people to put their trust and hope in God, and to invite them to lean on Him fully, letting Him show His strength in their weakness. This is one of the many songs written during the training. Vincent and Priscilla are currently still working with all the participants to professionally record the songs written during the training to enable them to be shared with Albanian speaking believers in Kosovo, Albania and all around the world.